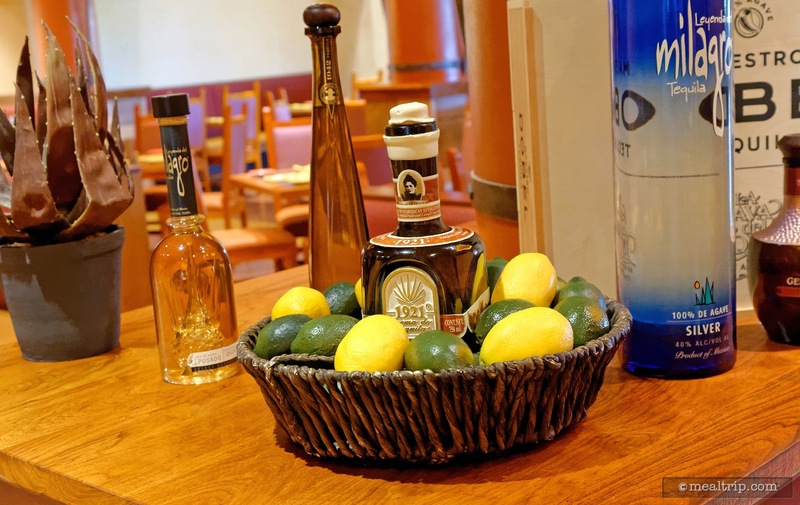 The Maya Grill is Coronado Spring's upscale table service restaurant that brings Mexican and Central American style accents to more accessible American cuisine. 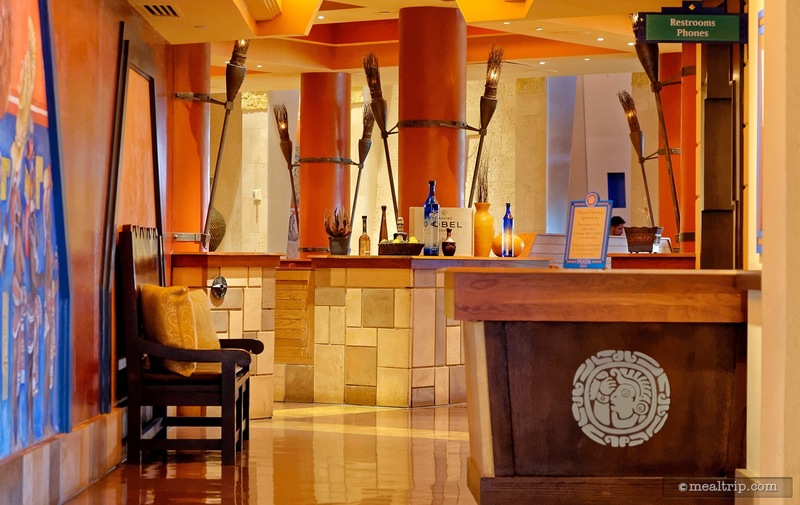 The segmented but large dining area blends some old world Mayan motifs such as fire, sun, and water, with more modern design element in the lighting, table and seating designs. The restaurant looks a little different depending on where you sit, and there are not too many "bad" seats. 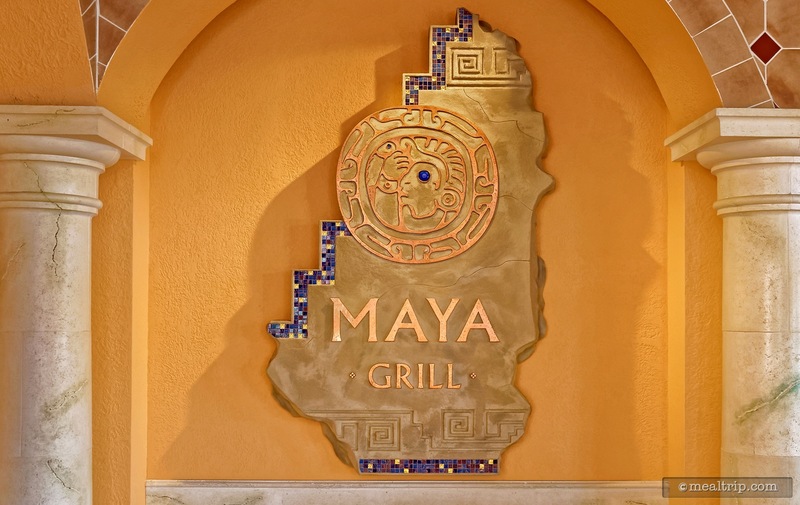 While dinner does begin at 5pm, we like the look that the Maya Grill takes on after dark, which in the summer can be somewhat later than most guest like to eat. The crowd patterns here are also a little different that at other Disney resort restaurants. Coronado Springs often plays host to business and convention guests, and they have "planned" events to go to in the evening. 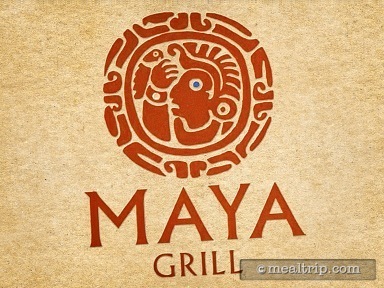 If you're getting the feeling that other restaurants in the parks are packed solid, you might want to check out Maya Grill. More times than not, they have available tables and time slots, and can even occasionally accept walk-ups. 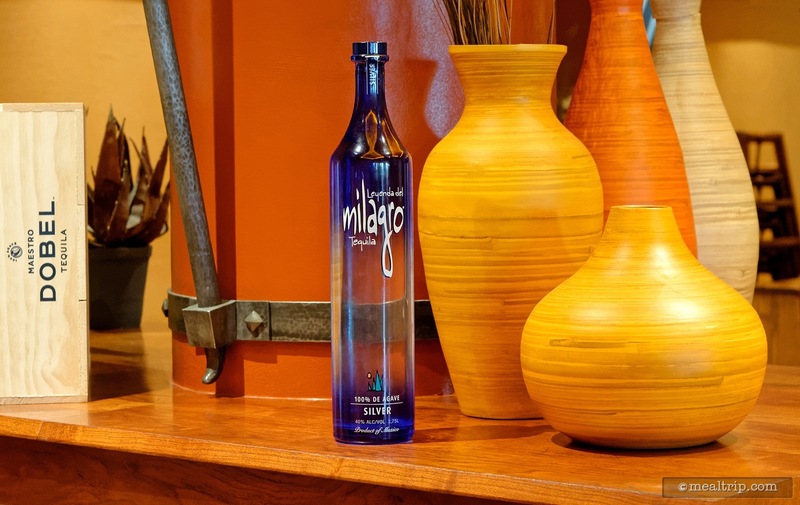 While the cuisine is American-Mayan, (as opposed to actual, pure Mayan), it strikes a good balance for a majority of guests. In fact, thinking of it as refined Tex-Mex, is probably a closer description. Starters include items like a Queso Fundidio with Chorizo Sausage and warm Flour Tortillas, a Taco Trio, House-made Guacamole, and Fried Tomatillos which are corn breaded tomatillos and a remoulade sauce, topped with poached shrimp, avocado and cocktail sauce. Entrées include a Mayan Pork Loin with unique accompaniments like orange-anchote, pickled onions guacamole and chilaquiles verde. A larger Shrimp Tacos plate is available align with a house signature Fajita Skillet. There is a New York Strip (because every table service restaurant has to have one), and a fabulous Red Snapper Vera Cruz, which is caught fresh and brought in daily. There are two or three "couples" platters available that serve at least two people including a beef and chicken platter, a seafood themed platter, and a signature Hand Cut Bone in Ribeye platter. A couple of unique desserts round out the menu including a Coconut Flan, Chocolate Abuelita Panna Cotta, and several smaller "Dessert Shots" that change somewhat seasonally, but often include Key Lime, Cappuccino Dulce de Leche, Chocolate Mud Pie, Peanut Butter Parfait, and a Gran Marnier Berries n' Cream.